VI. What do I need to know? After scheduling an appointment, the participation at a presentation of the club’s services. The pediatrician approval, stating that the baby/child is clinically healthy and able to conduct the psychomotor stimulation program. Approval from the family doctor, stating that the child’s attendant in water is clinically healthy. Any other medical notices to be determined by management as necessary. The session will be scheduled depending on the availability of the program grid and age category in which the child belongs. The set time and date does not change during the membership, except for those situations in which it is announced in advance (previous session). Scheduling will be done after presenting the services, once the administrative rules are accepted and signed. *our recommendation is to follow the child’s eating and sleeping schedule. The parent accompanying the child in water adjustment during the accommodation or re-accommodation period, has an emotional support role in the parent – child – teacher relationship and will comply with the instructor’s requirements, other water activities not being allowed (swimming, diving, jumping, Aquagym, etc.) or performing, at their own initiative, working maneuvers with young children (sockets, positioning, stimulation, immersions, etc.) without the approval of qualified personnel. The instructor is the only one entitled to observe that a child has become able to work without emotional support from the parent; he has the right to ask the parent to leave the pool or the pool enclosure if its presence affects the activity. In case the parent does not want to accompany the child in pool on the recommendation of the instructor, we mention that the accommodation / re- accommodation for children up to 3 years, will take place at an increased difficulty level. Memberships can be paid in Euros and Lei at the BNR rate of the day. You can pay cash or by card. The first month of membership is paid on completion of registration formalities, when signing the contract. To automatically extend the membership, a payment shall be made at the last meeting of the current subscription. In case of not paying for an extension, ceasing the membership is considered, which involves automatically losing the position on the program grid. Failure to appear at the scheduled time, for various reasons, should be announced at least 24 hours in advance in order to be recovered. Otherwise the lesson will be considered executed. In case the club will cancel the aquatic education lessons from objective reasons (holidays, vacations, renovations, technical revisions, etc. ), the membership will automatically be extended with the number of lost meetings. Recovery is granted depending on the availability of the program grid, respecting the age group and the maximum number of children, unless absence was previously announced. Scheduling for session recovery is performed only once; not showing at the recovery session means the meeting was executed. We cannot guaranty for the main instructor’s availability for a recovery session. The child will be fed at least 45 minutes before arriving at the pool. The access in the building is allowed only through the reception room, using slippers or disposable shoes. 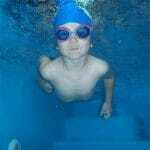 The session will always start on time and will end 15 minutes at the most, no matter the time of entry in the water. 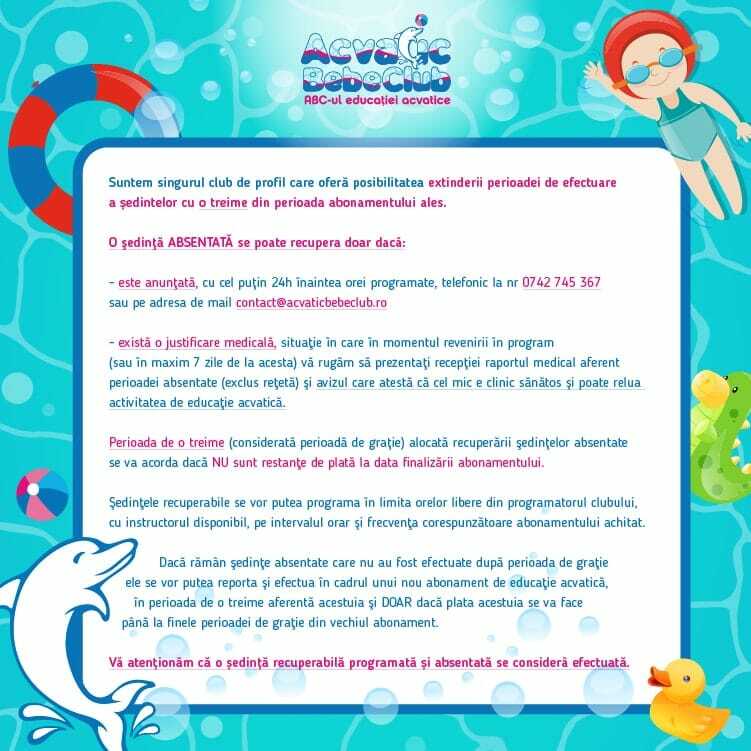 Access in the pool of children (or companions) who are carriers of communicable diseases, open wounds, dermatitis is forbidden. Also, if the little one presents symptoms such as: diarrhea, vomiting and /or fever, parents are asked to notify the club reception and cancel the session. Club qualified staff reserves the right to cancel the session if the presence of such symptoms appear before the beginning of the lesson. Under the rules imposed by the Department of Public Health, we ask all companions, who want to monitor the entire aquatic education session inside the pool to have an outfit specific for the aseptic area (changing rooms, swimming pool), which is swimwear, pool shoes, cap and gown. 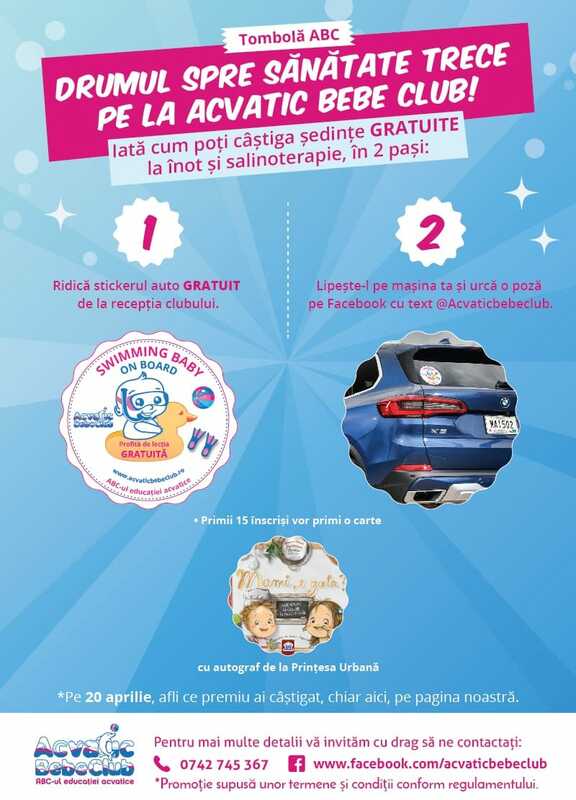 Acvatic Bebe Club is not responsible for losing or forgetting items in the club; for valuable items we recommend to use the key lockers or ask for the reception’s safe. Acvatic Bebe Club reserves the right to modify, revise or amend this regulation and tariff plan whenever necessary; any changes will be in effect when posting or notice.